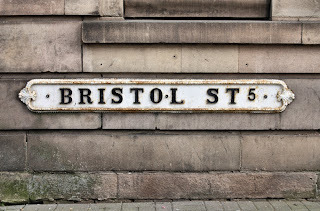 When Should I Book My 2013 Stag Do? 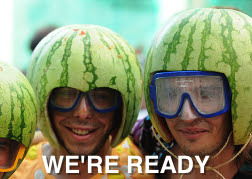 Great question, when should you book your 2013 stag do? 2013 Looks to be another busy year in the hen and stag do world and with hotels, flights and activity sites having limited accommodation on busy weekends booking early is great advice. Will I get penalised if people drop out? "Shish, that's another great question, you're on fire today"! This depends on what type of stag do you have booked and where you have booked it. If you book your stag do through DesignaVenture all UK bookings and bookings abroad without flights, you can reduce your numbers up until 4 weeks before you go*. If you have booked flights, check your booking conditions, my advice when booking flights or putting down a per person deposit; firstly make sure you are savvy with all the booking conditions and secondly, collect the money in from the boys before putting down any of your own hard earned cash. February is a funny month, it's too wet to go to the Med, in the UK the weather can be hit or miss and across the Continent they are possibly in the midst of -17 degrees in the day! So what can a stag do get up to in February? "Well this does depend on your budget my friend." 2 Nights in a 3 star hotel with breakfast, Clay Pigeon ShootingQuad BikingBlindfold DrivingHuman Table FootballNightclub Entry All this for under £135.00 per person*, it's a real cracker!! 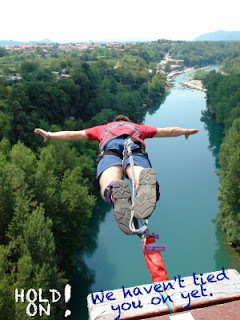 Stuck on what to do for 2013 and need some fantastic Stag Do Ideas? Well, look no further people here are some amazing things to do which are either unique or bleeding obvious. Let’s start with some unique stag do ideas, have you ever tried tossing the Caber, welly boot hurling or a traditional Haggis malt challenge? Just outside Edinburgh there is a fantastic activity site, which offers these traditional activities for stag dos wanting something a little different, and let’s face it, Edinburgh is an immense stag do destination. Something similar, near to Bristol is the West Country Games, which includes everything country such as; welly wanging, tractor tyre rolling, handbags at dawn, Wurzel knockout and so on. Bournemouth over the last few years has really transformed itself into an amazing stag do destination. Daytime activities are full on and plentiful and the nightlife can only be explanined as buzzing, wicked and incredible. Starting with the basic stag weekend ideas, get yourself to Bournemouth and become a beach bum, obviously stay in a hotel at night but during the day hit the Blue flag clean and sandy beach. The beach is so huge there is loads of room for game of 5 a side football, frisbe, volleyball or just plain and simple sun bathing. 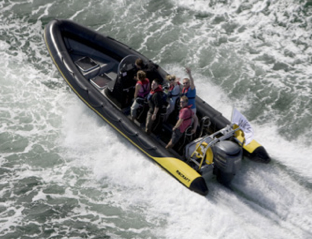 Moving on, if you have the need for speed there are loads of motorised activities from Rage Buggies, Quad Biking and Mini Racing to Outdoor Karting, HIgh Speed RIBs and Powerboating. If you need to shoot some guns there is some fantastic paintball sites, plenty of clay pigeon shooting and a new activity; shooting .22 Rimfire Assault Rifles (more on this to follow). 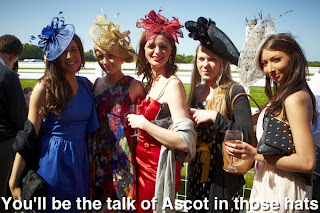 If you are looking for a fantastic stag do destination for 2013, then Reading is a great place to start. Reading has a great location, situated just off the M4, 40 minutes from London and has great rail links, so getting there will not be a problem. In the centre you have some excellent hotels, offering 4 star facilities, big buffet breakfasts and walking distance to all the nightlife. 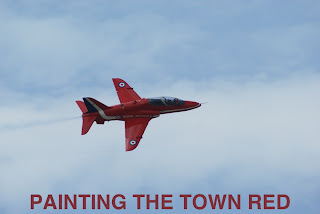 Reading has also some immense activity sites nearby and what would a stag do be, without full on activities? 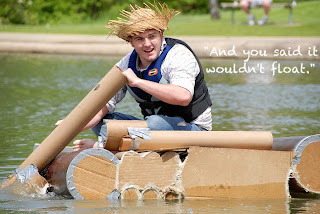 Anyway, enough of the sexism, Reading has some really great stag do activities such as the very funny Cardboard Boat Challenge to the fast and furious Rage Buggies. Shoot clays out of the sky or go Horse Racing. Nottingham For Your Next Stag Do Anyone? In the late nineties early naughties, Nottingham was the most popular stag do destination in the UK. Now after several years in the wilderness and in the shadows of other fantastic UK stag do destinations such as Bournemouth, Edinburgh, London and Newquay, Nottingham has seen a bit of a revival. The Nottingham city centre has had a fair amount of investment over the last few years, and some of the new kids on the block include some amazing restaurants*, lively bars and some banging nightclubs. *Some the of the best curry houses I have ever eaten in! Then you have the stag do activities and what a choice from Rage Buggies to White Water Rafting, Clay Pigeon Shooting to Quad Biking, Paintball to Indoor Karting, there are just too many stag activities to mention. However one of the most popular stag do ideas in Nottingham is It's a Knockout (pictured above). 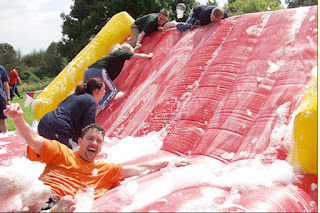 Foam, water, fancy dress and competition, what else do you need! Where on Earth is Riga? Riga is the capital of Latvia, which is an old Russian communist state, gaining independence on the 21st August 1991. Don’t get sweaty; I am about to tell you. Riga is not only one of the cheapest places to drink in Europe but also boasts possibly the most stag do activities available to man within a fair driving distance from your hotel. Some of these stag activities are also unique an amazing amount of fun. For example, Bobsleigh, you are speeding down a proper ice track (only in winter), giving you the REAL experience of an Olympian. In the summer when the weather is hot, you go down with an Olympic instructor using wheels, you still get up to some fantastic speeds. Then you have AK 47 shooting, now I have done this and it blows your mind (not literally). First of all you put it into semi automatic, then stick it into automatic, wowsers, it’s like the A Team titles in the 80’s. Stag Do! HELP! What Next? You have just been asked to be best man at your best mates wedding and the first thing you say is "what are we going to do for the stag do?" So, what are you going to do for your stag do? 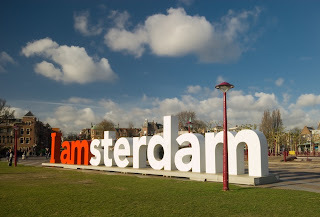 Is it a UK destination with loads of activities? 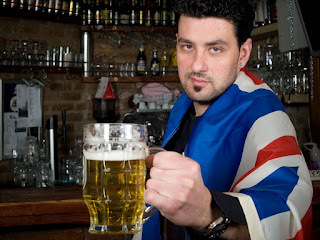 Eastern Europe for cheap booze? Or is it sun, sea and sangria in one of the Med's lively resorts? 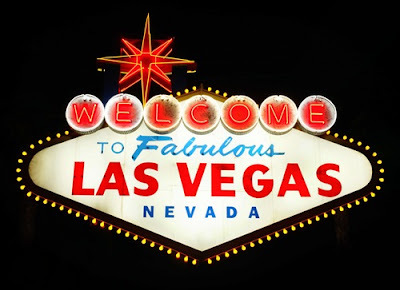 You only have to mention Vegas in the stag do world, and you know, not only is it one of the most popular stag do destinations in the universe, but also, the most famous bachelor hangout. So stag do, Vegas, enough said! Most stag parties are made up of friends and family who may not know each other. 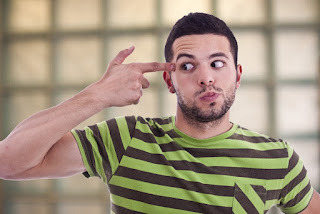 So, in order to get your group jelled you will need some cracking stag do ideas and an experience which will put everyone on a level playing field, something, that will take people out of their comfort zones. 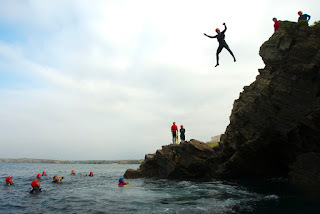 Two amazing stag do ideas which embrace’s this view are Coasteering and Canyoning. 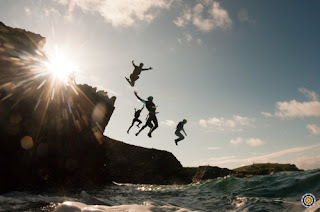 Coasteering is when you explore a rocky coastline jumping off ledges into deep pools, climbing and traversing rock faces and generally having a ball. Start on a sandy beach and explore the rocky coast gradually making your way up to some pretty impressive heights, and there's only one way down! Canyoning is very similar however, you will be exploring a gorge / canyon rather then the shoreline. The exploration of a gorge can include caves, waterfalls and a bit of swimming. You don't have to worry about buying in special equipment or clothing, all this will be provided*. 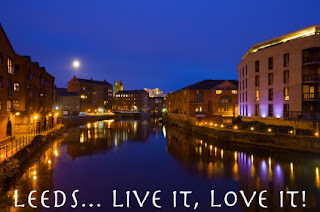 Leeds, Live it, Love it - is the City's slogan and you will see why when you arrive, it's a truly awesome city, packed to the brim with fantastic stag do ideas. The nightlife is fairly compact in the city centre with most clubs, champagne bars and clubs all within easy walking distance of each other, creating a mammoth bar crawl. From quirky retro bars to live music, comedy clubs and fantastic lap dancing clubs your nights out at home will never be the same again. By day, if you need something to keep the boys out of the bars, Leeds has the three main staples of great stag activities; shooting, racing and trekking. Shooting you have a choice of clays or shototing each other, Yorkshire is home to the ORIGINAL Paintball Monster, shooting 14 shots a second, have you met your match? 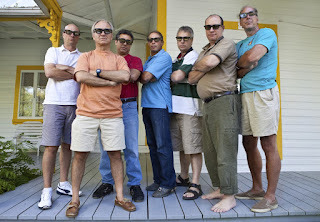 Whether you are on your second or even third stag do, or was just too wild in your early days to get married, I am hoping this blog will help you out with stag do ideas for the older gentleman. Age is a funny old thing and that cliche 'you are only as old as you feel' is so true, it's a mind thing. 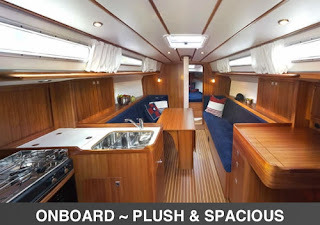 So whether you are knocking on the door of your forties or fifties you should be looking at all the stag packages on offer, regardless of what's involved and see if you fancy it or not. That's the great thing about becoming wise, peer pressure is like water on a ducks back. So, first things first, make sure you book decent accommodation, 3 or 4 star hotels are best with a full English included you cannot go wrong, just because you are on a stag do, doesn't mean you have to slum it.